An iSCSI target can be a dedicated physical device in a network, or it can be an iSCSI software-configured logical device on a networked storage server. 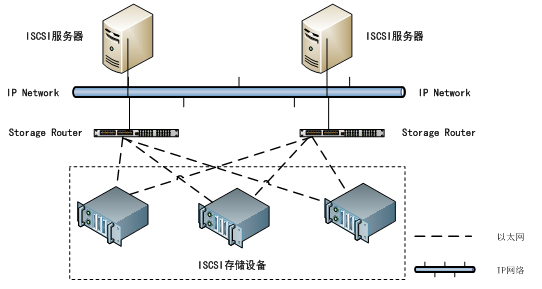 The target is the end point in SCSI bus communication. Storage on the target, accessed by an initiator, is defined by LUNs. Open port 3260 in the firewall. Start and enable the target service. Allocate storage for the LUNs. In this example a new partition is being created for block storage. Building a new DOS disklabel with disk identifier 0x43eb8efd. Edit the /etc/tgt/targets.conf file to create the target. In the above example a simple target containing one backing store and one allowed initiator has been created. It must be named with an iqn name in the format of iqn.YYYY-MM.reverse.domain.name:OptionalIdentifier. The backing store is the device the storage is located on. The initiator-address is the IP address of the initiator to access the storage. An iSCSI initiator is the client who wishes to access the storage on a target, or server. The IP address of the target needs to be known for this process. Discover the target. Use the target’s IP address, the one used below serves only as an example. 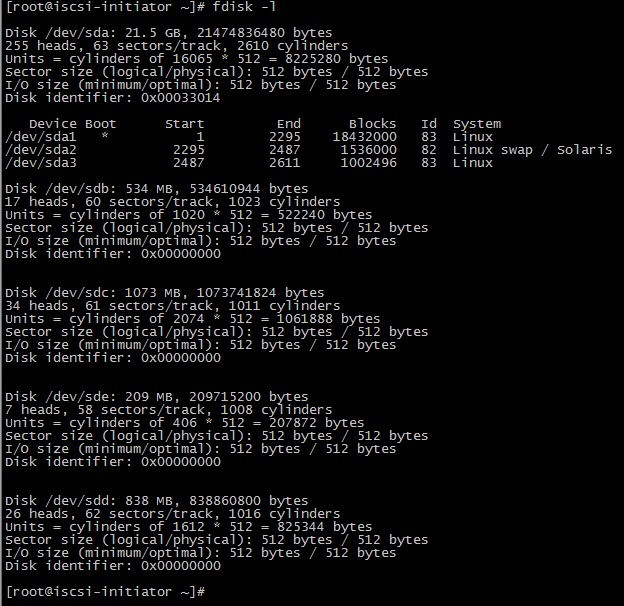 The above shows the target’s IP address and IQN address. It is the IQN address that is needed for future steps. Login in to [iface: default, target: iqn.2015-06.com.example:target1, portal: 192.168.1.1,3260] successful. 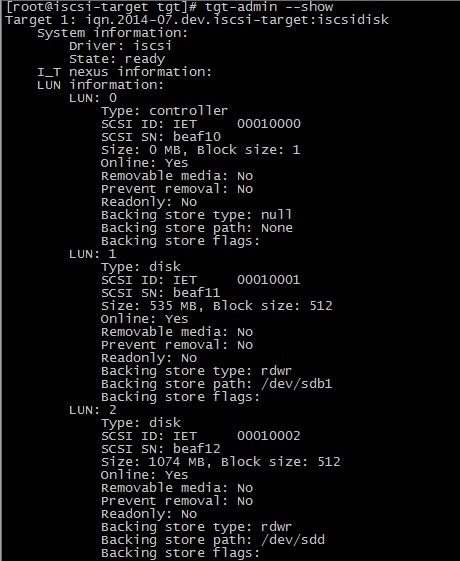 Find the iSCSI disk name. Create a file system on that disk. 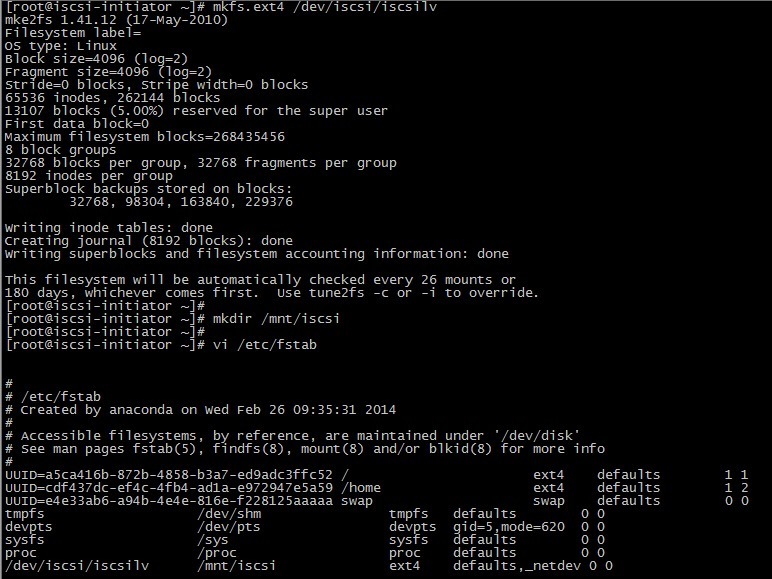 Make it persistent across reboots by editing the /etc/fstab file.